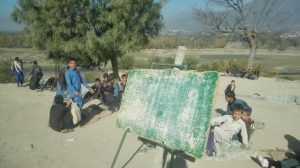 KHAR: Over 200 children, as young as five to ten years old are found to have been taking classes under the open sky in chilling cold in Khayati area of Bajaur tribal district. Tribal News Network learnt that this has been happening since its establishment 20 years ago. “Whether it is chilling cold of winter or scorching heat of summer, students never miss a single class,” said Said Munir, a teacher at Government Primary School Serai No 1. The school was approved in 1985 and teaching staff was hired but the authorities showed no interest to approve fund for construction of a building. A local malik has also donated land for the school building but the government failed to approve fund for the building. “Most of children fall ill due to cold and are forced to sit under sweltering heat of summer,” he said, adding that he has been teaching students in this schools for the 20 long years. The owner, who donated land, took it back and started growing crop on it after which they have shifted to a nearby barren land to take classes. He said that the issue was in knowledge of the authority of Fata Secretariat but no step was taken to construct a building. TNN learnt that senior officials at the Education Department offered the teacher a tent for children which the latter refused, excusing that he would not be able to watch it in nights. Local residents urged the government to approve fund for construction of a building for the school.